Look No More! Here is the Recipe Group you've been looking for. Recipes are in categories with a section for Requests and also a section for recipes for your pets. We even have essential cooking info and tips. 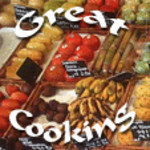 Check out our "different" recipes! The 10th Edition of the recipe book (pdf file) is now available! We had many more recipes added (23 more pages). Keep the recipes coming! Note: Let me know if you would like the cookbook in an e-books-type format. FYI, this may be the last edition of the cookbook.